LOS ANGELES — Before college basketball season began, new USC head coach Andy Enfield stirred up controversy when he told his team that if they wanted to play slow, they should head for the west side and play at UCLA. They play fast at USC, he explained. But Sunday afternoon at Pauley Pavilion, it was the Bruins who showed they are the fastest team in Los Angeles in a 107-73 route of their crosstown rivals. In the Pac-12 Conference opener, the Bruins scored a season-high and set a new record for the most points scored against the Trojans. It wasn’t the only record set. It was a dismal performance by USC and a dazzling one by the Bruins and it showed that UCLA, almost literally, runs L.A.
"We thought they would want to run and we thought that they liked to play fast. 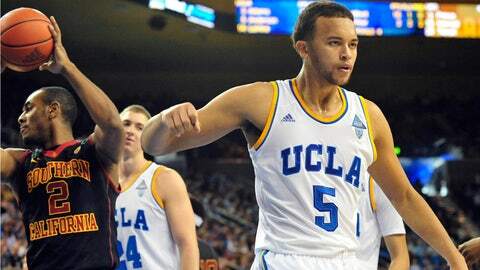 And that’s the way we like to play," said UCLA head coach Steve Alford. "We thought it was going to be a fast-paced game so it was about which team was going to defend the best." The Trojans played little defense, as is evidenced by UCLA’s 57.7 field goal percentage mark. It was the most points scored by UCLA against its rivals since John Wooden was at the helm in 1966 and it was the seventh time the Bruins scored 100 or more points against USC. The Trojans played right into UCLA’s transition strength, turning the ball over 17 times. Behind-the-back passing and reverse layups on the break gave UCLA extra chances, few of which they didn’t convert. "You have to take advantage of what they give you," said guard Bryce Alford. "Running is our main thing on offense. When we get stops, we are really hard to beat." "For some reason we didn’t look like the same team we have been over the last few weeks," Enfield said. "I donât know if it was emotional or if they were nervous, but we really made some very unusual turnovers for us. We were getting rushed." Long scoring draughts plagued USC. When center Omar Oraby was injured early in the game, the Trojans nearly collapsed on the court with him. After Oraby scored the first basket for USC, the Trojans went cold for more than four minutes and he returned only to foul out of the game. But his presence went for naught. UCLA had a 22-point lead at halftime and nothing the Trojans did could slow the Bruins down. "I think UCLA’s ability to shoot the ball rattled us a bit in the first half," Enfield said. "We thought they were good on film and they were even better in person." Kyle Anderson was the most difficult to contain, scoring 23 points with 12 rebounds and five assists. Jordan Adams scored 21 and the UCLA bench produced 44 points. For the Trojans, Byron Wesley scored 21 with nine boards. "This kind of performance is unacceptable and we just have to put it behind us," Wesley said. "Any time you lose it’s tough, but when you lose by almost 40 to your rivals there are no positives." Enfield may have gotten his dig in about UCLA early in the season, but Sunday afternoon, his team was unable to dig themselves out of the 34-point void they created. For another year, it looks as though L.A. belongs to the Bruins.